Q1. What is your interpretation of these rhythm strips? Q2. What would you like to do next? Are they stable, unstable or have high-risk features? On further assessment, the patient remains alert and asymptomatic with no chest pain, shortness of breath or presyncope. HR remains 59 with ongoing pauses of up to 4 seconds and episodes of bradycardia down to 30 bpm. 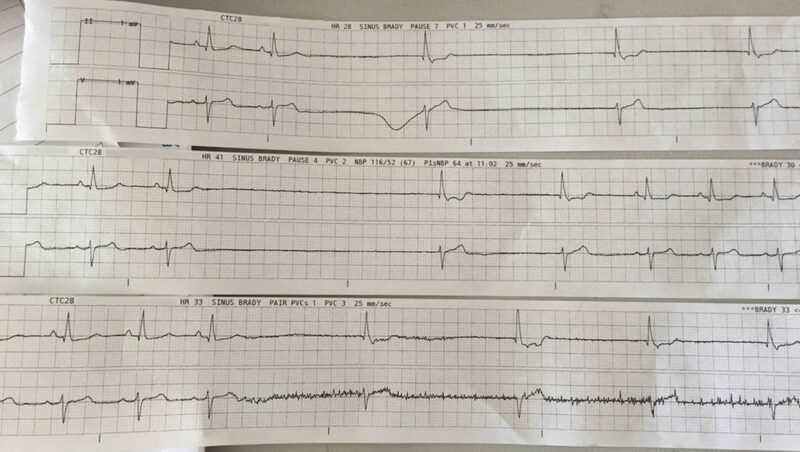 BP was 96/, improving to 127/75 when the rate spontaneously picks up to 60 bpm. Q3. What management options are available for this condition? Management includes pacing via pharmacological, transcutaneous, transvenous or epicardial routes. Isoprenaline is a synthetic sympathomimetic drug with almost exclusive beta agonist effects. Isoprenaline is called isoproterenol in North America. It can be administered via a proximal peripheral line in the short term, so it is worthwhile preparing it before the patient becomes unstable. Low-dose isoprenaline infusion can be run on the cardiac wards at The Alfred.